At the end of the day I gave silent thanks that I live in this great country, America; another reason to feel blessed. My 4th of July started quietly. The dogs and I went outside very early in the morning. I watched the sun rise over the red brick house, thought about plans for the day, while all three of the Border Collies sniffed the wet grass for signs of wildlife that may have passed through the yard. Our day had to start with dog training. Catcher nuzzled me at the breakfast table, encouraging me to get off my derriere and play/train him. Catcher, Tommie and I walked to the training building where I wrote a list of goals in my daily log . My days of using endless gobs of food in training have ended, much to Catcher’s dismay. Since one cannot, according to the AKC rulebook, take food into the ring and Catcher refuses to work without food, I had to slap myself broadside on the head and start to really train, which means, I have to give of myself in the form of energy, excitement and leadership. Oh, darn. This translates to work for both the dogs and me. But the transition from bribing the dogs to work to making them want to work/play with me is finally paying off. It’s something I’ll be working on all summer until we enter the fall shows. As always, I love the journey it takes to train the dogs, the moment the dog understands an exercise and the day they finally go from being confused to excited. The shows are not so much fun for me. Too much stress, which goes down the lead to the dog and diminishes my value as a team member. Sorry dog, I’m working on that aspect. After training and taking a break in the cool living room, I decided that Levi needed to become a therapy dog again for a day. He didn’t need a second command to get into the car. Our destination was the Memory Care facility where my dad lives. Dad is not a dog person or cat or horse person or any kind of animal lover, although he would profess that he is. I’ve noticed that he acts unnatural around dogs, pats them gruffly on the head, or gives them a nervous hug. Levi picks up on that at each visit but allows dad to touch him. When the Facility staff ladies came over to see Levi he really went to work, being mister loveable. Then one of the staff ladies opened up about dad’s recent escapades. He and another man walked themselves over to the ladies cabin nearby for a social visit. Dad went from near death and unable to get out of bed this winter to sneaking out to find a new girlfriend this summer. Dad had a sparkle in his eye when the story was told to me. On that note I gave dad a kiss and said I’d see him again soon. The rest of the afternoon I set aside to finish the book, The Martian by Andy Weir, that was due Monday from the Pensacola library. Although the book is filled with technical jargon that meant little to me, it is pertinent to the story . Two hours flew by and the end of the book didn’t disappoint me. On NASA’s third mission to Mars, one person is left behind on the planet, presumed dead. When NASA learns he is alive, the question becomes can he be saved? Should he be saved? This would make a great movie if Hollywood doesn’t rewrite the ending. You know how that goes, which is why I always try to read a book before the movie it’s based on is released. Earlier in the week I bought a NutriBullet. This winter my friends were raving on Facebook about juicing so I decided to see what all the hullabaloo was about. Kale is my favorite leafy green salad but as a base in the juicer, it was kinda icky. Now my daily juice contains spinach, melons, strawberries, Spirulina tablets, bee pollen and part of a banana. It’s fun to play around with ingredients. It turned out that the juice is delicious and filling and helps me with sugar cravings, which I battle. But has juicing made me super woman? Not yet but give me time. The dreaded July fourth fireworks evening brought the usual sounds of booms, bangs, zings and cracks from around the neighborhood. I suspect Levi’s hearing is going along with his eyesight as he wasn’t trembling and jumping on and off the bed like in year’s past. The volume on the TV was loud but perhaps it helped that I didn’t make a big deal of the explosions outside. The other two dogs were oblivious. 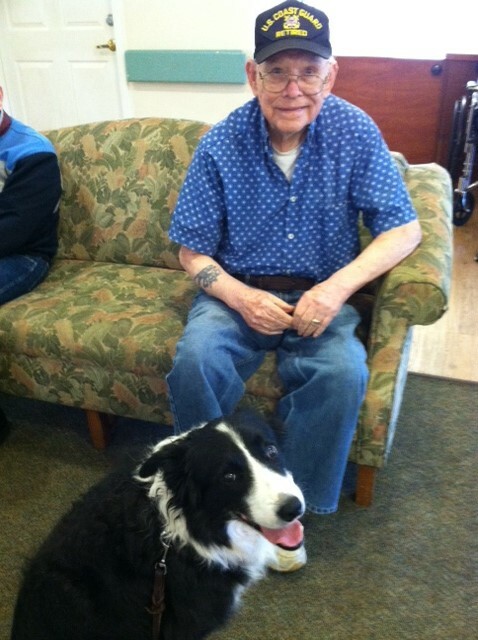 This entry was posted in border collies, Dementia, dog obedience, Dog training, Dogs, Retirement Life and tagged Border Collies, Dog training, fourth of July, Pets, retired life. Bookmark the permalink.